I have produced many portraits of the Commissionee's Boxer family over the years and little Sprout was the final portrait to be completed. I have visited the Boxer family many times, always taking my camera and capturing a multitude of photographs each time - it has always helped me capture their personalities as well as having watched them all grow into adults too, I think this knowledge and understanding helps massively when producing a portrait. Although the reference image is an excellent capture, there were just a couple of small adjustments that I had to make to the portrait to balance it all out and create the final Artwork. I opted to brighten up the catchlights in Sprout's eyes as I felt her dark nose took precedence over the initial first view of the portrait. I also needed to lighten up the throat area as the reference image looks as if it may have been taken in the afternoon on a grey day, resulting in the under side of her mouth and neck being darker than the rest of the face so I chose to even this out too. As Sprout and her other brothers & sisters have rather a large following on a well known social media site, the commissionee's ordered a couple of large prints for special friends. One was flown over to the States and the other within the UK. 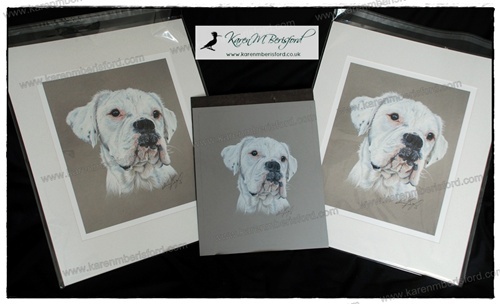 The fact that this family has asked me time and time again to produce portraits of their beautiful Boxer family (and their Boxer family before that) tells me that they are extremely happy with the end result - however, a kiss from the model herself is a priceless thank you for the final Artwork! Absolutely fantastic!! Sprout is perfect.